Halloween is a magical time where children of all ages dress up, and for one day, enter the world of make believe. The children wander through the neighborhood and chant "Trick or Treat" with hopes of getting treats that they will enjoy for days to come. Disney Cruise Line brings that Halloween spirit to life on every voyage with the Pirates in the Caribbean Party. 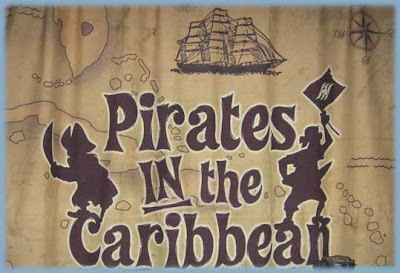 The party begins at dinner with the wait staff dressed in their pirate outfits and continues on deck later where everyone is invited to don their finest pirate gear and come to the party for food, entertainment, and even fireworks. Calling all prospective Pirates .... Visit my website to learn more about Disney Cruises and make plans for your entire family to enjoy a magical Disney cruise vacation this year or next. Royal Caribbean International is providing updates live from the bridge onboard the ship. 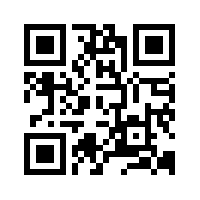 Watch my blog for updates on the journey. Watch Additional Oasis of the Seas Videos Here! Book a 7-Night Eastern Caribbean Cruise aboard the Oasis of the Seas by November 2nd and receive $100 Onboard Credit Learn more about Oasis of the Seas and applicable sail dates. Disney Cruise Line has unveiled images and videos of the third ship in the Disney family, the Disney Dream TM. 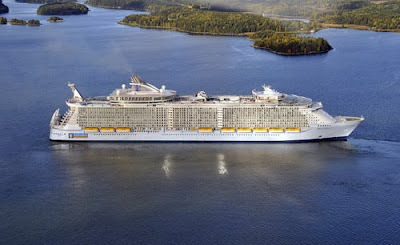 The new ship will begin sailing in 2011. The Disney Dream will have 14 decks with 1,250 staterooms which can comfortably accomodate 4,000 guests. It will weigh in at 128,000 tons and have a length of 1,115 feet (more than three football fields). The ship continues the traditional style of the first two ships in the fleet which were modeled after ships sailing in the early 20th century - known as the golden age of cruising. How fitting it is for this new ship to bear that name. Walt would be very proud of the Disney Imagineering team that have designed a classic ship with true Disney flare. As I viewed the images on the Disney Travel Agent site, I was certain that this new ship will bring many dreams to reality in the years ahead. When you think of Disney, what comes to mind? If you are even a slight Disney fan, you'll have no problem answering that question. Of course, it's Family fun. What could be more fun than riding the only Water Coaster at Sea? 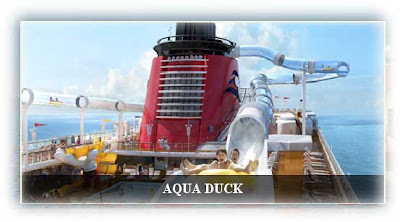 The AquaDuck pictured above (courtesy of Walt Disney Imagineering Concept Art) is a 765-foot long water attraction that takes guests on a magical ride around the top deck, through one of the ship's funnels, and down a full four-deck drop. Now that's a water ride!! My biggest joy is helping make dreams come true every day... I'm certain that the Disney Dream will make dreams come true once she begins sailing to the Caribbean and Bahamas in 2011. The ship has begun it's journey to it's new home in Fort Lauderdale, Florida where she will begin cruising the Caribbean. According to details released by STX Europe, the Oasis of the Seas is 361 meters long and 66 meters wide at its widest point and, at the highest, it rises 72 meters above the sea level. The gross tonnage is 225,000. At the best, the vessel can accommodate 6,360 passengers and 2,100 crew members. The ship features 16 passenger decks and 2,704 staterooms. The total power output of the ship's engines is 97,000 kW and the cruise speed is 22.6 knots. In this economic times, Royal Caribbean International's new ship orders for the Oasis of the Seas and the Allure of the Seas (which will debut in 2010) provided some 12,000 man hours of work to complete this project. When I speak with clients about their cruise vacation plans, one of the first questions that I ask is "What destination(s) are you interested in seeing?". I am happy to offer the following exclusive offers to my blog readers and clients. Now is the time to get away and use those vacation hours that have piled up all year long. Don't lose any hours - take a cruise vacation. I'd like to call your attention to the Oasis of the Seas sail in particular - December sailings including 2 Holiday Dates! Book a 7-Night Western Caribbean Cruise aboard the Liberty of the Seas by October 26th and receive $50 Onboard Credit, a Coupon Booklet & 15% Off Shore Excursions Learn more about Liberty of the Seas and applicable sail dates. Book an Oceanview or higher and we'll take an EXTRA $50, $100, or $200 OFF the total price. Hurry - offer ends November 4th! 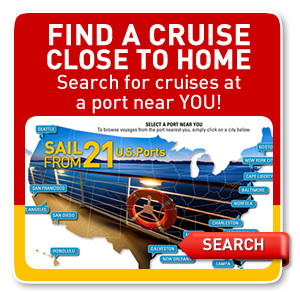 Learn more about sailings that are up to $200 Off and applicable sail dates. Click on one of the special offers for more details. Call or email me today - don't delay as inventory is very limited. Click for Hawaiian watches, warnings and advisories. Much of the focus the past week has been on the Tropical Storms in the Atlantic. That doesn't mean that the Pacific is exempt from tropical storms and hurricanes this time of year. We have been watching that area closely also. Once the NHC begins to monitor a storm, we'll add RSS feeds to this blog so that you can monitor the storm between posts. When developments become significant, we'll write a detailed article to help you plan your cruise vacation in the area. THE REMNANTS OF NEKI WILL CONTINUE TO MOVE RAPIDLY NORTH-NORTHEAST OVER THE NEXT COUPLE OF DAYS. MAXIMUM SUSTAINED WINDS ARE NEAR 35 MPH WITH HIGHER GUSTS. WEAKENING IS EXPECTED TO CONTINUE UNTIL DISSIPATION TONIGHT. Norwegian Cruise Line's Pride of America is the only ship in the area at the time, and is out of harms way, so there have been no ship advisories issued. Cruise lines monitor weather forecasts and take passenger and crew safety into consideration. During hurricane season, there may be itinerary changes due to tropical storms, so be sure to monitor any storms in the area of your cruise vacation. Continue to watch this blog for any tropical storm updates during this season. The 20th tropical storm in the West Pacific has intensified and become a Typhoon. A typhoon is a tropical storm with sustained winds in excess of 119 km/h or approximately 74 mph. If this storm were in the Atlantic, it would be called a hurricane. If necessary, ship advisories will be posted in this blog post. For anyone traveling in the Western Pacific Ocean, we suggest that you closely monitor this tropical storm. Unlike the storms in the Atlantic, tropical storms in this part of the globe are monitored by several local agencies. We'll include updates from them and provide other links to help you obtain the latest information about this storm and any impact to land or sea. UPDATE: 5:00 a.m., Wednesday, 21 October 2009... TYPHOON LUPIT has maintained its strength as it continues to move towards Northern Luzon. Live Cruise Ship and Ocean Liner Tracking:<Interactive tracking map> See where ships are relative to tropical storms. Our next destination in our series on Where in the World does Celebrity Cruise in 2010/2011 is Alaska. Few destinations invoke vivid images simply by their mention. Alaska is one of those that does. What do you think about when you hear "Alaska"? Perhaps you envision calving glaciers, snow-capped mountains, eagles soaring overhead, whales breaching feet away from you, a mother bear and her cub coming out of the woods, or a moose standing in your path. How about bright sunshine at 10 PM or clear blue skies that forms the canvas for multi-colored wildflowers blooming in the nearby fields? You might be thinking about salmon running upstream or the fisherman on boats nearby. These are but a few of the images of Alaska that you can view from the comfort of your railway car or cruise ship balcony on a Celebrity Cruisetour. The memories of the splendor of Alaska will stay with you for the rest of your life. Celebrity Cruises makes it possible for you to easily explore the Alaska of your dreams on a fully escorted Cruisetour. Combine that with the ship itinierary that interests you and you have the perfect formula for a worry free Alaskan adventure. Go beyond the coastline with a Celebrity Cruisetour and surround yourself in abundant splendor onboard the Celebrity Millennium®. Another tropical storm has formed in the Pacific. We will monitor this storm until it is no longer tracked by the NHC. This storm has the potential of becoming a hurricane by Friday. And if the current predictions hold, the storm will become a major hurricane by early next week. UPDATE: 200 PM PDT WED OCT 21 2009...RICK HAS DISSIPATED OVER THE HIGH TERRAIN OF MEXICO... MOISTURE ASSOCIATED WITH RICK COULD PRODUCE ADDITIONAL RAINFALL AMOUNTS OF AROUND ONE INCH OVER PORTIONS OF NORTHERN MEXICO. This will be the last update on this tropical storm. Carnival Splendor – The ship will visit Ensenada on Monday, Puerta Vallarta on Thursday and Cabo San Lucas on Friday. Carnival Spirit – The ship will operate the scheduled itinerary. Our highly trained officers and crew will do everything possible to minimize the impact to the cruise experience for our guests. The ships will navigate at a safe distance from the storm at all times. Carnival’s number one priority is the safety of our guests and crew. This information will be updated if any additional changes are required. Royal Caribbean International continues to closely monitor the itinerary of Radiance of the Seas due to Hurricane Rick, and will update this information again today, October 19 at 6:00 p.m. E.S.T. Radiance of the Seas is scheduled to depart San Diego, California, today. According to the most recent weather forecasts, the ship will be able to depart on time and head south to Ensenada, Mexico. However, it is too early to know if the storm track will permit the ship to continue to visit Cabo San Lucas, Mexico, on Thursday. Should the ship be unable to visit Cabo San Lucas, an alternate itinerary has been arranged, in which guests would visit Ensenada, Mexico, Los Angeles and Catalina Island, California. As mentioned in previous posts, there are a number of special offers throughout the month. I'd like to call attention to the following offers which are valid after this week. 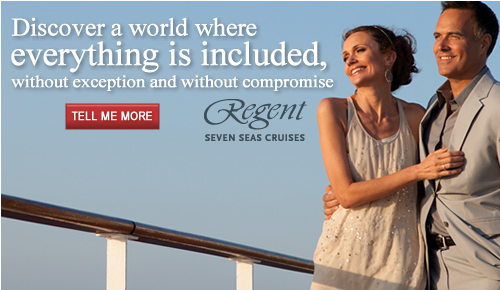 Valid for Caribbean and Europe sailings through December 2010. Onboard credits: Inside cabin will receive $ 25 pp (max $ 50 per cabin), Oceanview cabin will receive $ 50 pp (max 100 per cabin), Balcony and Suite stateroom will receive $ 100 pp (max $ 200 per cabin). All offers are for New Bookings ONLY and may have additional Terms and Conditions. As mentioned in previous posts, there are a number of special offers throughout the month. I'd like to call attention to the following offers which are only valid thru October 16th. World's Largest Cruise Night 2009 Is Finally Here! 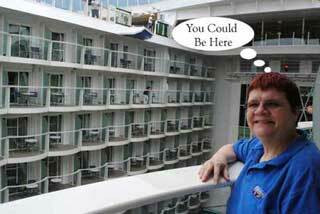 I'm writing this on our last sea day onboard Carnival Pride R/T Baltimore to the Bahamas. We've had a successful National Conference this week. Besides meetings and visiting three ports of call, our group participated in a worthwhile cause. Carnival Corporation hosts On Deck for the Cure which is available on 14 ships. This innovative fundraising initiative benefits Susan G. Komen for the Cure. Each participant receives a T-Shirt and pink wrist band to signify their participation in this walk / donation program. Get a little exercise and donate to a worthy foundation. On your next Carnival cruise, make sure to check out this fundraising event. Back home the temperature is in the 60s but here in the Bahamas it's a balmy 90 with humidity. What a perfect day to spend under a palm tree in a hammock. The ship arrived in Nassau around 11 AM and we departed shortly after that for Blue Lagoon. It's a short boat ride from the pier to Blue Lagoon. On the way to the private island, the boat passes Atlantis resort and many expensive homes. There are plenty of photo opportunities along the way for capturing the beautiful turquoise waters of the Bahamas. After arriving we found a location with several hammocks and picnic tables and put our bags down on one of the tables. It was time to relax and enjoy the beautiful surroundings, catch some rays and enjoy the various water sports. I'll leave you with that image for now. 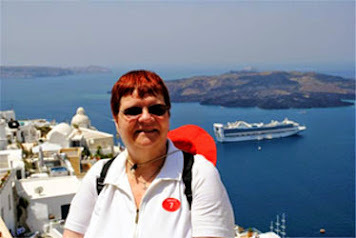 When I return from our cruise, I'll tell you more about our stay and include some pictures. Meanwhile, I suggest you take a look at my website for Carnival Pride itineraries out of Batlimore. This is the perfect vacation for families, especially those that live near Baltimore. I'm writing this to you from Carnival Pride, the host for Cruises Inc. & Cruise One 2009 National Conference. We are at sea today somewhere off the coast of Florida. Tomorrow we will be in Port Canaveral where we will have a group outing to Disney World in Orlando. Carnival Pride sails out of Baltimore for a fun filled 7 night cruise to Port Canaveral and the Bahamas. This is a perfect get away especially for families on the East Coast of the United States. It is within driving distance from many cities and a great way to relax with your family without having to fly to your destination. In addition to Carnival Cruise Lines executives, there are executives from many of the cruise lines onboard with us all week. We are learning about exciting changes each company will be introducing or have already introduced. I'll be sharing information about this in future columns. I'll have to keep this short since I'm off to lunch and then more meetings. Now is the time to plan your next cruise vacation. There are some amazing offers available this month for National Cruise Vacation month, so send me an email to start your planning. CELEBRITY CRUISES a premium cruise line, has one of the youngest and most innovative fleets of any major line. Since Celebrity's first sailing in 1990, it has been recognized as an industry leader, praised for providing friendly and engaging service, exotic Elemis Spa facilities, award-winning gourmet cuisine, and an overall atmosphere of easy elegance. Purchased by Royal Caribbean International in the late 1990's, Celebrity has grown its fleet significantly while maintaining its Premium niche. Celebrity currently has a fleet of nine elegant ships. One of Celebrity's ships is the Celebrity Xpedition. The Celebrity Xpedition's size allows 92 guests to experience the Galapagos in a very comfortable expedition style ship. ; Plying the world's waters in high-tech comfort are Century, and Mercury which are host to 1870 guests. Celebrity's Millennium Class of ships include Millennium, Infinity, Summit and Constellation each host 1950 guests. 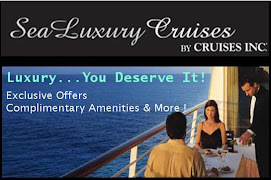 Each is a ship of incomparable beauty featuring sumptuous amenities, impeccable service and comfortable accommodations. 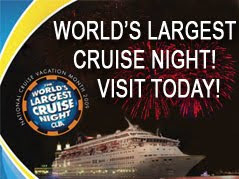 Join Us For The World's Largest Cruise Night - A Virtual Cruise Night! Offers are valid on new bookings made by October 31, 2009; based on availability and are not combinable with any other offers and/or discounts. CARNIVAL CRUISE LINES holds the status of not only being the largest cruise line in the world, with a fleet of 23 "Fun Ships", but one of the most popular. The line's fleet is one of the newest and most modern. At 110,000 tons, the line's new "Conquest-class" is the largest in Carnival's "Fun Ship" fleet. The first of the 2,974-passenger super liners is the Carnival Freedom. Carnival offers a choice of itineraries, from two- to 17-days, to worldwide destinations, including the Bahamas, the Caribbean, Mexican Riviera, Alaska, Hawaii, the Panama Canal, Bermuda, Europe, New England and the Canadian Maritimes. In 2006, several new sailings will be offered from all along the Eastern Coast to the new ports of call. Cash Back up to $70 per stateroom on Select 3 & 4 Day sailings. 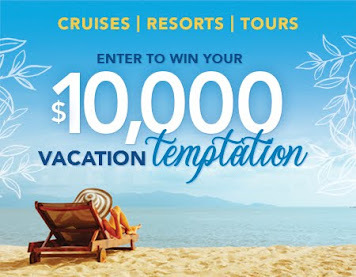 Cash Back up to $100 per stateroom on Select 5 & 6 Day sailings. Cash Back up to $200 per stateroom on Select 7 & 8 Day sailings. Offers are valid on new bookings made on October 14, 2009; based on availability and are not combinable with any other offers and/or discounts. AZAMARA CRUISES was introduced to the US market in 2007 by Royal Caribbean International & Celebrity Cruises as a separate "Deluxe" brand of cruising. The Azamara brand is different from Royal Caribbean and Celebrity Cruise sister companies in many ways. This "Deluxe" niche designation puts the cruise experience above the "Premium" niche where Celebrity is and puts this brand in competition with Oceania and Crystal. The Azamara Cruise experience is focused upon the destination, rather than the vessel, and clients find that the brand offers a shipboard experience where attentive personal service is offered in a country club casual atmosphere. The Azamara fleet consists of 2 very popular former Renaissance Cruise Line Vessels. These modern mid-size ships host 698 guests, offer a wide variety of dining options and have been radically refurbished to have their own distinct upscale look. Azamara Journey and Azamara Quest cruise in Europe, South America and the Caribbean. Azamara voyages tend to be longer in length and the itineraries often include overnight stays in popular ports of call. AMA WATERWAYS adds two new ships, the MS Amadolce and MS Amalyra to their fleet in 2009. The vessels join Europe's most luxurious and state-of-the-art fleet, comprised of the MS Amadante (2008), MS Amacello (2008), MS Amalegro (2007), and MS Amadagio (2006). Renowned for their innovative, award-winning ships, personalized service and signature features not found aboard any other cruise line, AMA WATERWAYS offers an array of unparalleled cruise vacations on the legendary rivers of Europe. They also proudly offer magnificent itineraries in Portugal and Spain, Provence and Spain, and the fascinating waterways of Russia. Save up to $1000 per stateroom on select November/December 2009 Christmas Time Cruise, Christmas Wonderland and Winter Heartland Cruise. Save up to $500 per stateroom on select 2010 April/May Romantic Danube and Enchanting Rhine cruises. Join our Virtual Cruise Night Starting October 1st. While October 14th is the annual Worlds Largest Cruise Night major event, as a reader of my blog you have the opportunity to participate at your leisure throughout the entire month of October. Cruising is all about choice and we have assembled videos and special offers from 21 different CLIA member Cruise Lines. 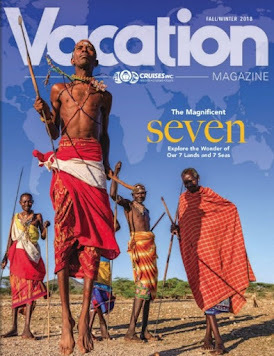 Throughout the month, I'll also feature several of the cruise lines in blog posts, so be sure to come back often to read my articles. There is no need to get dressed up and go to some location for this cruise night. Simply sit back in your easy chair and check out the videos and featured offers. Call or Email Me for Additional Details about the Cruise Line / Offers that interest You. Mention that you read about the Virtual Cruise Night on my Blog for a special gift.